The first edition of this important map to illustrate all three of Cook's seminal voyages. 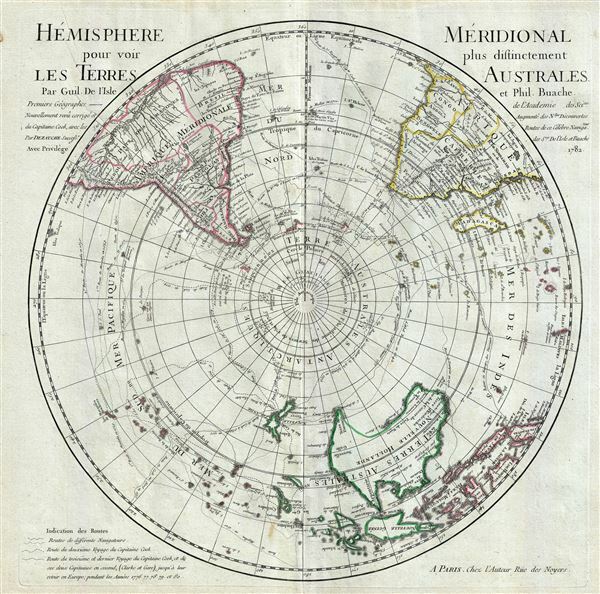 This is a stunning map of the Southern Hemisphere drawn by Guillaume de L'Isle and updated in 1782 by Jean-Claude Dezauche. Extends from the South Pole northwards in all directions as far as the Equator, encompassing in the process most of South America, southern Africa, Australia, and parts of the East Indies including Borneo, New Guinea, Java and Sumatra. Details the routes taken by numerous important navigators including Magellan, Vespucci, Mendana, Dampier, L'Aigle, S. Louis, Halley, Quiros, Maire, Tasman, Davis and of course Captain Cook. This map went through many incarnations, the present example being perhaps the only edition to illustrate all three of Captain Cook's seminal voyages. As such the map offers numerous updates throughout including a partially complete mapping of Australia (though Van Demien's Land or Tasmania remains attached to the Australian Mainland), numerous updates to the shoreline of New Zealand, and some of the southernmost navigations then recorded. Most of the earlier updates, that is those predating this, the Cook edition, focus on the explorations of Lozier de Bouvet. An account of Bouvet's explorations appears on both sides of the map proper - in French on the left and in Dutch on the right. Bouvet explored the Antarctic seas in the late 1730s. In January of 1739 Bouvet discovered an iceberg ridden sea and sighted an outcropping of land he called Cap de la Circoncision. Based upon Bouvet's calculations this would have been the southernmost point of land ever sighted. At the time, and for roughly 100 years previous, geographers had speculated on the existence of a Southern Continent. The idea of such a continent was based on a theory of balance. Geographers theorized that the weight of Asia had to be counter balanced by a similarly massive continent in the extreme South. The great proponent of this theory in the 18th century was Geographer to the King and Academie des Sciences member Philippe Buache de la Neuville. Bauche was the preeminent geographical theorist of his day and used Lozier's discoveries to promote his own ideas of a Southern Continent. Thus, returning to our map, we see evidence of Bauchian Antarctic theory in the inclusion of Cap de la Circoncision on this map just south of the Cape of Good Hope. Bauche would later theorize that the Cap was actually attached to a great continent further south and that it was the outlet for a large Antarctic Sea. Following Lozier de Bouvet, subsequent explorers had a great deal of difficulty finding Cap de la Circoncision. Our maps shows Captain Cook's own search for the Cap extensively on both his first and second voyages. One of Cook's associates, Captain Furneaux also searched the area with little success. The issue seems to have been a miscalculation by Bouvet regarding Longitude (a typical problem at the time) that placed the island about 23 degrees too far east. The land was finally rediscovered by Captain James Lindsay in 1808 who realized that it was in fact an island and not attached to a greater southern landmass. It was sighted again by the American whaling Captain Benjamin Morrell in 1822 who renamed it Bouvet's Island in honor of its original discoverer. On to other parts of the map. De L'Isle, based on only the sketchiest knowledge of the region obtained from the voyages of Abel Janszoon Tasman around Australia, maps Australia, or in this case Terres Australes, as attached to both Tasmania (Van Diemen's Land) and New Guinea. Despite this, western, eastern, and northern parts of Australia are drawn with relative accuracy while the southern portions are postulated with a dotted line. South America, roughly three quarters of which appears here, is well mapped along its shores though speculatively in the interior. Our map shows the Laguna de los Xarayes and the lands of the Xarayes, a corruption of 'Xaraies' meaning 'Masters of the River.' The Xaraies were an indigenous people occupying what are today parts of Brazil's Matte Grosso and the Pantanal. When Spanish and Portuguese explorers first navigated up the Paraguay River, as always in search of El Dorado, they encountered the vast Pantanal flood plain at the height of its annual inundation. Understandably misinterpreting the flood plain as a gigantic inland sea, they named it after the local inhabitants, the Xaraies. The Laguna de los Xarayes almost immediately began to appear on early maps of the region and, at the same time, almost immediately took on a legendary aspect as the gateway to El Dorado. Africa, as was common in the 18th century is full of speculative details regarding the mountains, rivers systems, and indigenous peoples of the interior. The cannibalistic Jagas, identified hear as 'Antropophages' appear near what is almost certainly a very embryonic form of Lake Malawi. On Madagascar I. de St. Marie, the probable location of the legendary pirate kingdom of Libertatia is identified. Delisle, G., and Buache, P., Atlas Geographique et Universel, (Dezauche, Paris), 1782.
very good. Original centerfold. Pressmark visible. Blank on verso. Slight damp staining upper margin. Rumsey 4764.005. Newberry Library, Ayer 135 .L695 1741 v. 1, pl. . Phillips (Atlases), 595 no.3, 596 no.3. Tooley, R. V., Mapping of Australia and Antarctica, 42.